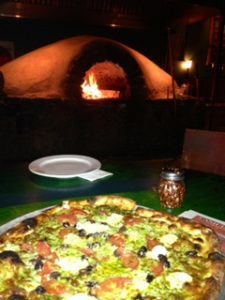 One of our favorite Pizzas here at Maui What A Wonderful World, Bed and Breakfast is Flatbread Pizza in Paia. Paia is a small hippie vibe town about 25 minutes from our bed and breakfast home here in Maui. Although Paia has many great eateries, diners, cafes, and shopping, we love this place. Jim and I usually order the Pele’s Pizza cooked in their brick pizza oven facing the dining area. The pizza oven is the anchor of the Pizza Parlor. The kitchen is completely open so you can see your pizza being made from a ball of dough taken right off the “raising” shelves, to the rolling and stretching of the dough to make the prefect flatbread. You can watch all the toppings and ingredients begin added and then watch it cook in the pizza oven. I am ready for another one right now as I write this! We usually order a side salad each, with the addition of a scoop of goat cheese from the surfing goat dairy on Omaopio Road. 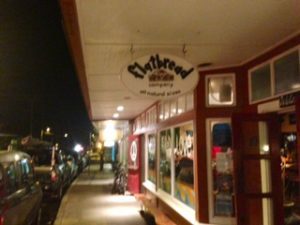 Flatbreads offers many topping and sauces for their flatbreads, most of which are grown or caught if not in Maui then within the hawaiian islands. They list where each item was purchased each day on the board near the entrance. They even have a gluten free option for the pie. Reservations are not required. Many of our B&b guest tell me the wait is usually not long, during that time the guests of our bed and breakfast walk down the street and view a few of the shops Paia has to offer. From Maui What A Wonderful World, Bed and Breakfast in Kihei, drive back toward the airport. Take a right on Hansen Road and another right onto Hana Hwy. As you enter Paia, Flatbreads in on your left. Parking (paid parking) is usually quite easy behind Charley’s off Hana Hwy. or in front of the post office (free) on the dirt parking off Baldwin Avenue.